It wasn’t long ago that South African wines breached the R1,000 mark and now it’s difficult to keep up. International experts are quoting SA as ‘the most exciting wine producing country’ and quality is at an all-time high. Compounded by high inflation, a depreciating Rand, surging prices and ambitious winemakers, the resulting pool of luxury is like nothing ever seen before. Price is surely the most important factor when qualifying a luxury wine but brand equity and packaging plays a decisive role. There is no point in serving a luxury wine if your guests don’t know that you are serving one! And then, of course, there is intrinsic quality and styling. Luxury wines must taste luxurious and not only appeal to the collector or aficionado. Compared to the rest of the world, South African wines are still rather cheap. We have no wines that can compete with Bordeaux or Napa Valley when it comes to seriously expensive wines produced in large quantities. Apart from heavy bottles, lavish packaging and relatively jaw-dropping prices, which of our super-priced wines offer quality to match? Vilafonté refers to the unique soil on which the Vilafonté vines are grown and it is one of the world’s oldest soil types. Produced on the Paarl-side of the Simonsberg Mountain, Vilafonté has consistently been regarded as one of SA’s most luxurious wines since their 2003 release. 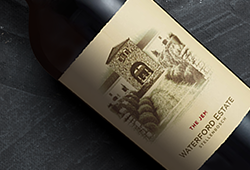 It is closer to a Napa Valley than a Bordeaux in style; showing a generous fruit-sweetness and plush tannin that is almost unique in South Africa. Not only exquisitely packaged, the Bordeaux-blend Series C 2015 is possibly the finest yet. It’s a rich and succulent vintage that can be drunk early but it will age well for a decade or more. Impressive on the table and in the glass! 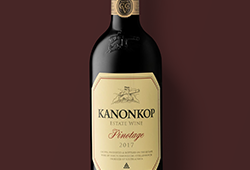 Kanonkop is undoubtedly an South African ‘Grand Cru’ or ‘First Growth’. No other producer holds the track record of quality and consistency over the last 4 decades. Incredibly, Kanonkop’s long-standing winemaker Abrie Beeslaar has just won the ‘Best Winemaker in the World’ title for the third time! Their luxurious flagship is produced from their oldest Pinotage vines and exudes a richness and depth like no other. It shows luxuriously sweet oak in its youth but with time it gracefully integrates to produce SA’s most patriotic luxury wine. Rust en Vrede has quietly regained its position as one of SA’s top wineries since its heydays of the 1990s. While their luxurious ‘1694’ is more expensive than the single-vineyard Cabernet Sauvignon, for me the Cabernet it is more precise, enchanting and ethereal. Produced from the best vines on the slopes of the Helderberg Mountain, it is arguably one of SA’s best Cabernet Sauvignons. Bold, powerful and sleek, this is the epitome of luxury. 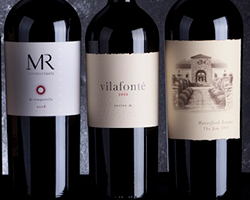 The MR de Compostella is the most revered Bordeaux-style blend in SA; both locally and abroad. The 2015 is Bruwer and Mzo’s third Platter 5-star winner in a row and perhaps their finest MR yet. Here is where quality meets demand and price as wine lovers all over clamour for the new vintage every year. Unlike the rest of the wines in the line-up however, the more classically-styled MR needs another 2 or 3 years to show its best. Add the MR to your cellar and not the dinner table this year. Drop for drop this is one of SA’s most expensive and sweetest wines. Whatever Andrea and Chris Mullineux touch seems to turn to gold and the Essence even more so. It took 4 years for this Chenin Blanc to ferment to just 4.5% alcohol, leaving behind a whopping 650g or 65% sugar! It is hugely rich, unctuous and exotic but with a high acidity that makes it an impenetrable wine that will age forever. It is one of the highest rated SA wines from international critics, including 98 points from Robert Parker’s Wine Advocate. One only needs a tiny glass to enjoy this ‘diabetic’s worst nightmare’. That’s if you can find it; a mere 700 bottles were produced.